When my children were each preschool-aged, I taught using thematic units that were about a week or two long. Often these were on seasonal topics (Apples, Leaves, Animals in Winter, Turkeys, Snow, Spring Weather, Seeds and Plants, Pond Life), with other fun topics thrown in about topics of current interest (Trains, Firemen, Pets, etc.). Creating thematic units simply meant that I’d choose piles of beautiful picture books on a topic and then add in hands-on art, so-simple “science,” and print-and-go thematic math and letter activities that I found for free online. It was perfect for each of my preschoolers and worked for including younger tots, too. Those years of doing homeschool preschool were among my favorites so far. I treasure my memories from those years and would go back and do them all over again in a heartbeat! I loved making all of the messy, colorful art with them and seeing them learn their letters and numbers against the backdrop of our fun themes. What I loved most, though, was cuddling up and reading all of those lovely picture books together. More than anything, picture books were how our family did preschool. As my children have grown older, picture books have remained an important part of their learning. Picture books aren’t just for little kids! Picture books can be integrated into homeschooling from preschool to elementary to middle school – and yes, even beyond. Fiction picture books are excellent for subjects like history, geography, character development, math, and grammar. Children can experience a time in history or a land far away through the story of another child, family, or animal. Important topics in character development can be conveyed in a gentle manner through stories, rather than in a heavy-handed and preachy way. And difficult concepts, such as those found in math, can be explored through fun and humor. Similarly, non-fiction picture books are especially excellent for subjects like science, history, geography, art, and music. The combination of information with lots of pictures can help bring to life people, places, and ideas from the past or from far away. Complex concepts that are difficult to visualize without the benefit of illustrations and diagrams are clearer and more accessible in picture books. Even if you use a longer anthology or textbook for your core reading, a picture book can serve as a launching point for a new topic or unit. It can be great for piquing an interest into something brand new, helping to activate your children’s prior knowledge on a topic, or serving as a first-day-of-something-new discussion starter. This year, our family is using My Father’s World Adventures in U.S. History. While there are two longer anthologies that we read from, the history portion of this program relies heavily on the use of living picture books to flesh out the topics. We have used so many wonderful picture books already this year to bring to life the topics that we are studying and our learning has been the better for it. Whether you use a pre-planned unit or create your own, picture books can definitely take center stage (along with chapter and other books) to serve as your main source of teaching material. Don’t discredit picture books as being too simple. 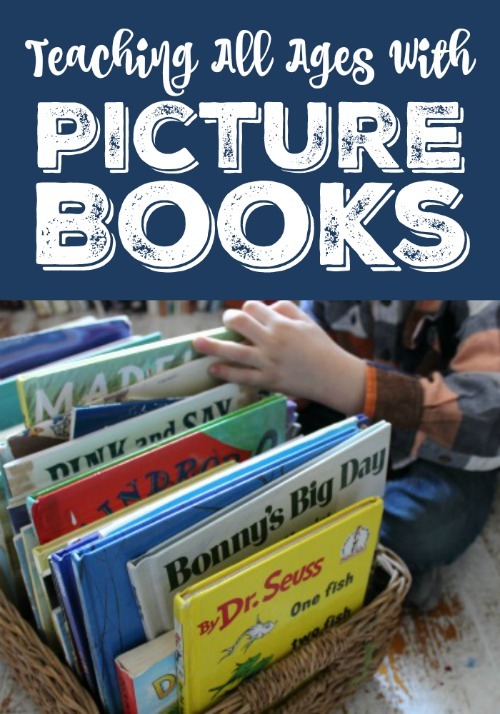 Not all picture books are just for little kids! In fact, many are substantial, meaty, and complex and are actually intended for students in upper elementary through high school. We’ve read many picture books this year that are of that variety. There have been several, in fact, which I most definitely could not narrate back in entirety – and I have two college degrees. Picture books can be used to introduce younger children to persons, periods in history, places, historical events, and new concepts, and then used later with older kids for reference and to study a topic more in-depth. Every child has a subject or two that they like less than others or that they struggle with. Picture books can be a balm for a frustrated child and add some whimsy or humor to an otherwise tedious subject. For example, picture books sprinkled into math and grammar can be used to explain something difficult or just make things a little more paletable. Not every question or topic that a child takes an interest in can (or needs to be) given days upon days of study. 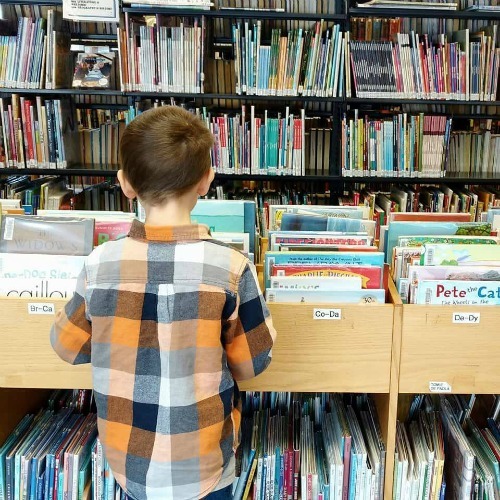 Having a sizeable selection of nonfiction picture books in your home collection, or similarly utilizing a library, is a good way to answer those pressing question, travel down the rabbit holes, and learn a little bit about something that may just be a passing interest. Many are familiar with the idea of reading one Christmas book a day to countdown to Christmas. Similarly, although not in as great number, our family has many picture books for most of the lesser holidays and for all of the seasons. As a new holiday approaches or a new season begins, I weave these books into our morning reading after we do devotions, Bible reading, and prayer time. I leave out the seasonal picture books on our main bookshelf, but I store the holiday books away and just pull them out as needed as a particular holiday approaches, thereby keeping them special. Many of these books are the same ones I used to use back in our preschool days. But I always add a few meatier, more substantial ones to our shelves each year. As mentioned, our family has been doing a study of U.S. history this year. We’ve used many wonderful picture books along the way, and I’ve decided to purchase quite a lot of them for our home collection with an eye for the future. We won’t study U.S. history every year, but our nation’s holidays, the anniversaries of notable national events, and the birthdays of famous Americans and leaders do occur each year. As with the holidays and seasons, I plan to pull these out each year to keep our history and its lessons fresh. Let’s face it, unless you are homeschooling an only child, homeschooling multiple ages is a balancing act – and a challenging one at that. At some point, most of us realize that there are not enough hours in the day to teach all of our children all of their different subjects separately. Some things must be combined, and picture books can be the glue that binds a topic together. Even though children from middle elementary on upwards will likely glean more from the chapter books they’re reading (or you’re reading aloud) on a given topic, the whole family can still learn together from picture books on the same topic. This is an especially good way to bring along the youngest members of the family into whatever you’re studying. In medium or large families, many homeschooling mamas feel guilty on occasion that they aren’t able to give everyone the same amount, or type, of quality time. For example, doing preschool with your firstborn likely looked quite different (and maybe better) than it does with your youngest because you now need to spend a substantial amount of your day doing “real school” with your older kids. Or, maybe it’s the opposite – you’re just starting your family and you already feel guilty for not being able to “do preschool” with your oldest the way you’d like to because you’re constantly nursing a baby and chasing after a toddler. Either way, snuggling up with picture books is meaningful quality time that you can spend with your children – whatever their ages. Real learning happens, and it’s a great way to cover topics that might otherwise get neglected amongst the busyness of your days. When my children were all preschool-aged and under, we’d read maybe 75% fiction and 25% nonfiction picture books. These days, that ratio has flipped. 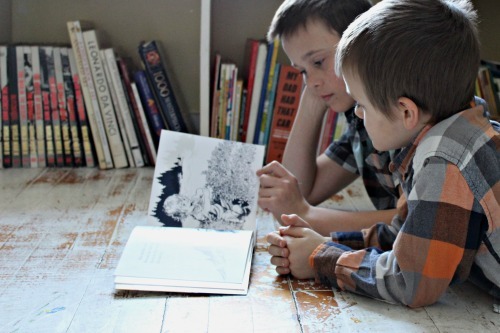 By design, adding picture books suitable for older kids is part of our family’s annual homeschool expenses. The older my kids get, the more times a day I seem to say, “I’m not sure…Let me Google that and find out.” It’s wonderful to have a home library as a go-to source of research, too – for me, and for them. Need some inspiration? Below are some excellent picture book choices. For the sake of simplicity and space, I have included only book series and authors that have multiple books on related topics. In many cases, the series and authors below have dozens of titles to choose from. Of course, there are innumerable stand-alone picture books out there as well! Great post. There are so many meaty picture books and I use them like you have described. I will be checking out some of the ones I'm not familiar with on your list. I also love David Macaulay's books (Pyramid, Castle, Cathedral) as well as books by Aliki (Mummies Made in Egypt, Manners, etc). For the biggest picture books, I love to spread out over several days at our morning time so we can really let them sink in. That's a great point, Jen! I spread the bigger, meatier picture books out over several days, too...sometimes, with really lengthy ones, even over a week or more. Thanks for sharing the additional titles.